When Karen told me she hadn’t been able to find Martha KNIGHT’s arrival in Australia I began searching. 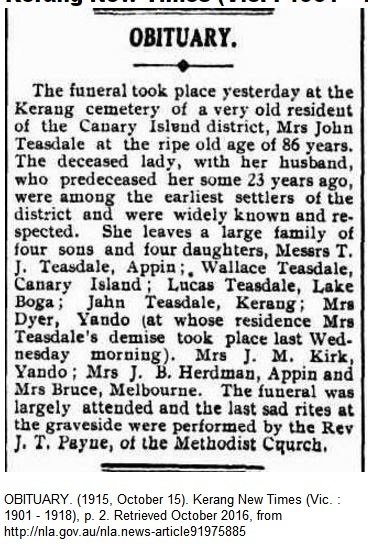 According to her newspaper obituaries Martha’s sister, my great-great-grandmother, Ann Jane KNIGHT, was said to have arrived in Australia in 1847 from Gloucestershire. I don’t know who supplied the information. According to information given to Karen by other family members, the family came from Trowbridge in Wiltshire. The DNA matches of we four KNIGHT descendants do agree with these findings. In the 1841 census, John KNIGHT was a weaver living with his family at Melksham, Trowbridge. John had married Ann LUCAS on April 8, 1824, in Trowbridge, Wiltshire. The Knight family, consisting of father John, mother Ann and daughters Sarah, Jane (my Ann Jane), Martha and Ruth arrived in Tasmania on the ship Orleana in 1842. Ruth went into domestic service for George MacLean who was the Deputy Commissary General for Hobart. John went to work for a W Wilson of Davey Street. The PINCHEN family also arrived on the Orleana. In 1846 Ruth married William PINCHEN. They had five children born between 1849 and 1859 in Geelong, Victoria. William 1849, Charles 1850, Jane 1853, Ellen 1855 and Elizabeth 1859. 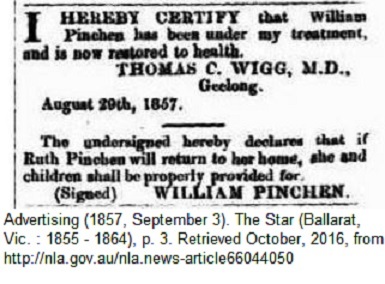 William must have had health problems as there was the following notice in the Star newspaper of Ballarat in September 1857. Ruth didn’t stay with William though as records show in 1862 she had her first of six children with John TEASDALE. Florence born 1862 at Creswick, Victoria. John Knight born 1864 at Spring Creek, Victoria. Ruth born 1866 at Happy Valley. Wallace born 1866 at Happy Valley. Lucas born 1869 at Linton. Alice Maud born 1871 Spring Creek. Ruth PINCHEN married John TEASDALE in 1883. On the 9th of September 1852 in Geelong, Martha KNIGHT married James WHITE. Witnesses were William and Ruth PINCHEN. Martha and James had two children, Elizabeth Ann born 6 September 1853 at Ballarat, Victoria and James William born 11 September 1855 at Ballarat East. On the 6th of September 1863 at Geelong Martha married Henry Phillip MARETT. They had nine children at Ballarat. Martha’s husband, Henry Phillip MARETT died at Leederville, Western Australia on the 6th February 1905. Martha died on the 9th of December 1907 at Caulfield, Victoria. I have yet to find deaths for John KNIGHT and his wife Ann nee LUCAS.